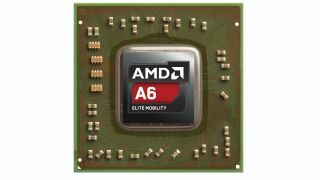 AMD launches new mobile chips: will they be in your next laptop or tablet? Under ever-increasing pressure from Intel, AMD has formally announced its yearly refresh of its mobile processors. Known as APUs (Accelerated Processing Units), the hybrid GPU and CPU chips will be branded A4 and E2 at the value end of the market, and A6, A8 and A10 for performance laptops and what AMD calls 'ultra-thins'. These latter chips are – generally speaking - designed to go squarely against Intel's Core i3 and i5, while A4 and E2 will take on Celeron and Pentium in budget, mainstream laptops. All are based on the same Jaguar cores as the AMD-powered next-gen consoles as well as the new Graphics Core Next (GCN) GPU architecture. Behind the branding are three different hardware platforms; there is an ultra-low power quad-core platform for tablets and small touchscreen Windows 8 laptops codenamed Temash. According to figures from AMD, Temash offers 5x the performance of the comparable chip from Intel's Atom (Clover Trail) platform. Speaking at a recent briefing attended by TechRadar, AMD's head of mobility Kevin Lensing talked up Temash. "There's an opportunity to redefine the tablet a little bit, so you can redefine what people do on their slates. There's no other part that can do what you saw on this class of device. Compared to the [comparable Atom processor] you 200 per cent improvement in terms of performance per Watt in 3D Mark 11." We've seen that silicon in several rather underpowered Windows 8 tablets so far such as the Asus Vivo Tab. AMD's mainstream platform carries the Kabini codename and is said to be 25 per cent more efficient over the preceding generation of silicon, offering a cited 1.5 extra hours of battery life during 720p playback. "[This chip] brings quad-core to this market and completely outclasses Pentium. In fact, it's a clean kill over Pentium and it's going to dominate the open level of the notebook space." In terms of specs, the Temash and Kabini clockspeeds range between 1.0-2.0 GHz with power consumption between 3.9 and 25W. The highest power Temash chip is 9W. Further up the chain, the performance segment is known as Richland and, according to AMD, boasts productivity gains around 12 per cent and 40 per cent better graphics performance over the previous generations. "You want a high powered notebook to feel snappy," said Lansing. "And of course we're going to give you the best graphics, the best compute." AMD believes it can still has a lot to offer in value and performance systems alike, but it also sees a lot of opportunity in tablets and convertibles as Windows 8 gradually takes bigger slice of the market. Lensing laid down a challenge for Intel's upcoming Bay Trail Atom chips – "we've got plenty of headroom in Temash" also hinting he expects favourable comparisons with Haswell (Intel's next-gen Core processors) with the higher-end chips. Lensing also claimed AMD was "uniquely positioned" to provide users with better tablet experiences because of its expertise in graphics. "We've got to make great devices. This is where our silicon is focused, on tablets and performance tablets and it's small form factor touch notebooks. There are lots of guys making silicon for smartphones and trying to pull it up in terms of performance, there are lots of guys making silicon for old client [PC] devices and trying to push it down into this space. "We're focusing our dart right in that area, in the convergence space. We have optimised for the best performance per watt in the four to 14 watt category. You have to optimise for that space to win – you can't optimise for a desktop or notebook and win in this space. We're uniquely positioned here." "The world has taught us that gaming is the number one revenue stream on iOS and that the world is sensitised to graphics on these devices. And of course graphics is where we shine. So you take the graphics expectation on these devices and the graphics [we do] on Windows and bring those two worlds together. Devices that enable you to get things done but also devices that have a great display and form factor. So you're not switching between three or four devices every day, it's [about] one device." AMD also announced a technology known as DockPort. Similar to Intel's Thunderbolt in concept (in fact, Lansing said it was almost DisplayPort+), it enables USB, power and display over a single connection. Another technology for tablets, called TurboDock, manages power when undocked but ratchets up performance when you dock the tablet. "We're very focused on giving you a full notebook experience in these devices. TurboDock keeps it nice and cool when it's in your hand, but when in a dock it ratchets up to the full notebook experience." We'll have a review of AMD's new Kabini mainstream laptop platform very soon on TechRadar.